The cheering probably hasn’t stopped in Everett, Wash. Navy Secretary Ray Mabus was the bearer of glad tidings and Christmas cheer Dec. 9 when he announced that the carrier Nimitz, for the past nine years based in San Diego, would be homeported at Everett Naval Station after 12 months of scheduled maintenance at Puget Sound Naval Shipyard in nearby Bremerton. The compliment was nice. But replacing the carrier Abraham Lincoln, being lost next year to a multi-year overhaul in Newport News, Va., following its current deployment, and maintaining such a powerful generator for the local economy, is the much bigger deal. A carrier brings with it millions in federal money for carrier services and support and area improvements, as well as the millions sailors spend on rent, utilities, shopping, and local and state taxes collected on same. 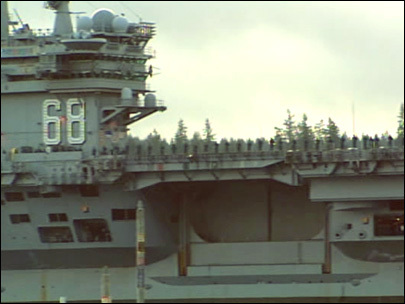 San Diego, meanwhile, is now down two carriers — but only until 2016, when a new flattop will arrive; a spokesman for Rep. Susan Davis says she was given that news by CNO Adm. Gary Roughead, according to NBC SanDiego. The Lincoln’s overhaul and refueling will take more than three years — near-perfect timing, it would seem, to fill that void.